Back in high school days, I used to ditch classes and when we get caught, we entered detention room. I wish detention room was like Class 302. Their setting reminds me of my elementary class room where huge blackboard was filled with multicolor chinese characters and drawings. Elementary text books are clipped on a cloth string beneath the board and school uniforms are hung-up on the wall. We were seated in wooden school chairs and desk and greeted with school-uniformed waiters. Not only they have an extraordinary concept of ambiance, their shave ice is to die for! Unlike usual shave ice, their snow ice so flavorful yet super smooth like sorbet. Instead of condense milk drizzle on top of the ice, the milk is actually frozen together with the ice and shaved delicately to create flaky ribbon-like ice. 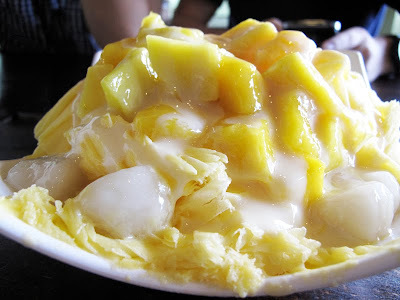 Top that off with chunks of ripe mango, mochi, and condense milk and we welcome mango snow ice heaven! After saying "Oh my goodness, why I never had this before" for like ten times, the green tea snow ice arrived and I was even more dumbfounded! 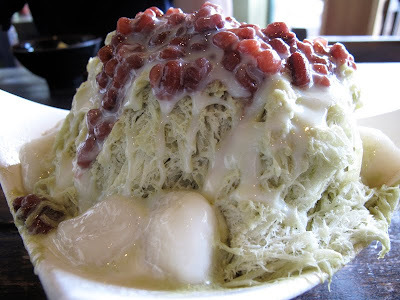 The green snow ice has a subtle green tea flavor to it, and it's topped with sweet lavish red bean and mochi chunks. I'm hooked!! !